Most common varieties of lavender are native of Mediterranean, Atlantic islands, Asia Minor and India, however, lavender can be grown nearly anywhere in the world. There are at least twenty-five species of lavender. Processing lavender begins with drying the flowers. For small gardens, the flowers are harvested and bundled, hung and dried in a well-ventilated shady place. For medium-sized gardens, the flowers are harvested and placed flat on drying trays up off the ground. The best drying conditions places the tray in a well ventilated, shaded area. Larger fields are commercially processed with dryers. The volatile oil is distilled from the dried flowers through a steam process. Hardy Lavender’s best method of propagation is by cuttings or layering. Long cuttings from plant three years old or more have higher success. Select healthy branches of the early spring softwood, dip into root promoting powder and plant to a 3 – 4 inch depth. To propagate over winter, many gardeners choose to layer several branches. Remove the leaves from the midsection of low-lying hardwood stems. Cover the midsection with dirt, leaving the ends above the soil. Tender Lavenders propagate easy by seed. Start seeds indoors in a flat tray with good drainage. Fill the tray with one inch of soil, sift the seeds, cover seeds with ½ inch of sand. Water the soil with a fine spray. Keep soil moist. Cover with clear plastic wrap for 14 days until seedlings sprout. Once the seedlings have their first four leaves, the lavender is ready to transplant. Notable similarities of all varieties is the shape and size of the flowers which range in color as they ripen from pale mauve, blue, blue-green, to vibrant purple flowers. The leaves are narrow width and grayish green color. The more loam in the soil increases foliage growth but does not enhance flower growth. Lavender (Lavandula officinalis) is a perennial shrub with an average height of 32 inches at full bloom with an average circumference of 24 inches. The plant grows best in well drained, poor, calcareous soil with full sun. With proper growing conditions, it’s possible to have two harvests; first in late spring, and second in autumn after a cool summer. This variety of lavender grows best in well drain soil. Since it grows in cloudy areas it usually isn’t ready for harvest until Autumn. From the Latin “lavare” which means to wash or bathe, ancient laundresses added lavender to the wash water. The earliest medicinal record for Lavender is among the first century writings of Dioscorides, a Greek physician who lived in Ancient Rome. His materia medica was in continuous use from his lifetime until 1600AD. This ancient doctor suggested lavender to treat “griefs of the thorax”. European folk tradition regarded lavender for use on wounds and as a remedy for worms. Victorian medicinal era used lavender to relieve regular headaches, migraines, trembling, passions and cramps. Alchemists categorize lavender as hot gender under the ruling planet of Mercury. Used in concoctions that required representation of Air, lavender served as an ingredient for purification baths of Midsummer Celebrations as recounted in Shakespeare’s famous play. Renaissance tales call lavender by the folk names “Spike” and “Elf Leaf”. During this period lavender gained a reputation for enhancement of love, specifically to attract men into love affairs. Craft and home products use lavender as a main or important ingredient of the mixtures. Some of the products include: sachets, drawer liners, hot pads, wands, potpourri, tussie mussies, and wreaths. Lavender is regularly used as an anti-inflammatory, carminative, diuretic, insomnia, mild sedative, relaxant, stomachic, and spasmodic. Since the earliest use of the steam distillation process developed in Persia during the 11th century lavender has been often used in fragrance recipes. In fact, lavender oil is a basic fragrance ingredient many popular personal care products and perfumes. Traditional use of lavender in whole or in part helps increase healing of a variety of ailments. A sampling of the uses of lavender as treatments for ailments include: a topical application for athlete’s foot, an aromatherapy remedy for breastfeeding problems, a topical remedy for burns, an infusion for colds, a chest run for coughs, an aromatic for depression, in massage oil for headaches, a topical spray for an insect repellant, a topical ointment for treating stings, and a topical salve for sunburns. Contemporary uses add to the traditional list of medicinal uses to aid healing of acne, cellulite, emotional heath, fibromyalgia, menopause, and stress. In general, all lavender are perennial plants in garden growing zones 4 through 8. Older plants look good through winter with a silvery hue. Younger and new growth is brighter green than gray. Leaves vary in size and dimensions. Stems shoot up during early spring. The flowers also called spikes vary from a tapered shape to blunt ends. Hardy Lavenders are of a Mediterranean origin. Dwarf Musthead named for the gardener who cultivated it. Dwarf Musthead is a low compact version of lavender with stems that spike at about 4 inches above the shrub. The spike flower is a true lavender purple. It can grow equally well in garden beds or in containers. Folgate Lavender grows slightly larger than the Dwarf Musthead. Spike flowers are blue and grow 4 – 5 inches above the bush. Grey Hedge, another variety of Lavandula angustifolia shrub or hedge grows larger with a silver hew to the leaf. The spikes mauve colored and are more pointed and thin. Hidcote Purple is among the largest of the Lavenders growing to 30 inches with long dark purple spikes which gives the Hidcote Purple Lavender its name. Old English Lavender is among the original English garden varieties of Lavandula angustifolia are hardy with their denser shrub with broader grey green leaves. The spike flower blooms a mauve color. Seal Lavender grows to a height of a full 3 feet with the optimum growing conditions. The leaves are gray-green year-round. The flowers compliment the bush color with a blue-mauve flower. This variety of Lavandula angustifolia yields an extended bloom season up to four months. Twickel Purple compares with the Hidcote Purple but in a smaller form. Twickel Purple is an unusual variety in that the spikes present in a fan-like formation of the deep mauve flowers. Broad-leafed Lavender (Lavandula latifolia) has much broader gray colored leaves. Lavandula latifolia is the common commercial variety because it has a comparatively larger quantity of fragrant oil. Dutch Lavender (Lavandula x intermedia) is the result of cross-breeding of Lavandula angustifolia and Lavandula latifolia. A distinguishing quality from the parent plants is the leaves are narrow compared to Lavandula latifolia but broader than Lavandula angustifolia. The spike flowers are long & branched. Dutch Lavender blooms later in summer and has a notably strong scent. Wooly Lavender ( Lavandula lanata) grows to 2 feet with a diameter of up to 3 feet. This short squat version of lavender has gray leaves with tiny hairs on the stems and leaves. The spike flowers can grow to a foot above the bush with heads of dark blue. Tender Lavenders origins are traced to the Spanish & Southern French regions. Lavandula stoechas is the historic lavender used by Romans during ancient times through to the Middle Ages. The green leaves have a pungent and notably camphorous scent. The spike flowers of this lavender are irregular globes with small flowers hidden between the purple bracts. The two long brilliantly purple bracts grow to a point reaching upward to 1 ½ inches in length. This variety grows well in acidic soils. French Lavender (Lavandula dentata) has graceful green leaves. The fragrance of these locally known Spanish Lavender or French Lavender blends balsam with camphor. This variety blooms prolifically throughout most of the year. The constituents of Common Lavender (Lavandula officinalis) consist in the form of volatile oil, tannins and coumarins. Within the Volatile oil up to 1.5% per volume, the active ingredients listed in degrees from highest to lowest in content are linabol, linalyl acetate, lavendulyl acetate, terpinenol, cineole, camphor, borneol, pinene, and limonene; within the coumarins, the active ingredients include coumarin, umbelliferone and hemiarin . Spike Lavender (Lavandula latifolia) has higher percentages of camphor and cineole than other forms of lavender. Popular in French Cuisine, a chef may use lavender in a recipe or as a part of a sprinkle on top of savory dishes including beef or fish, or on cookies or pastries. Natural Cosmetologist who seek to enhance not only their clients beauty but also their health work with natural botanicals that have low allergens and high health value. Lavender as an edible as well as its topical usage is perfect for the whole body aware cosmetologist. Massage Therapist enhance the massage experience by providing just an bit more relaxation by using essential oils in their massage oil. Lavender scent helps relax the mind, as the lavender oil works its way in through the skin to relax the muscles as well. Aroma therapists use lavender as a basic scent in many of their mixtures. The relaxing aroma can improve relaxation, and increase restful sleep as well as boost pleasant and rejuvenating dreams. Traditional Folk Doctors used lavender for a variety of ailments. It seems that lavender was among the stock medicines before allopathic medicine developed. From flesh wounds or burns to remedies for breathing problems or headaches, lavender was a value herb since the beginning of medicinal treatments. 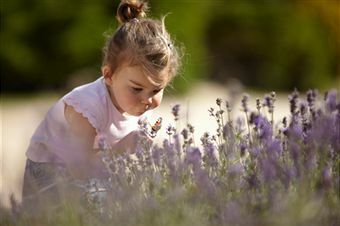 Herbalists & midwives used lavender to aid healing before, during and after the birth process. Lavender’s qualities helped reduce stretch marks, aided in stretch the perineum and removed the smells of birth by adding lavender to the bedding. Crafters use lavender in a variety of products for the house. From front door wreaths to drawer sachets the Victorian housewife or 21st Century crafters adore lavender for the variety of colors and the powerful and lingering scent. Aroma therapy oil created from a mixture of essential oil of lavender with base oil. Popular brands: Ananda Apothecary, Aura Cacia. Flowers are used whole, crushed or ground in culinary or medicinal mixtures. Popular brand for culinary bulk flowers: Starwest Botanicals, Frontier Herb. Cosmetics used lavender in beauty products including: facial scrub, masks and other astringent mixes. Lavender steam for complexion treatment leaves skin moist and firm. The steam is also good for the lungs. Popular brands: Little Mama Products, Avalon Organics. A popular scent, lavender can be found in handmade soaps, shampoos, conditioners, deodorants and other personal care products. Popular brands: South of France, Kiss My Face. Traditional use and dose of lavender flowers for cough and colds suggests brewing an infusion of the flowers and drinking several cups of lavender throughout the day. Another way to administer lavender for cold symptoms is through steam inhalation two or three times per day to loosen phlegm and relax bronchial passages. Medicinal Herbalists of the 19th century used of the higher potency lavender oil in the treatment of diphtheria, streptococcus and typhoid bacteria. Massage therapists add one or two drops of lavender oil to blank massage oil to help increase muscle relaxation, aid in treatment of headaches, neuralgic and rheumatic pain. Medicinal infusions are made as a tea. Place the herb in a serving teapot. Pour boiling water from a kettle over the herb into the teapot. Place the lid on the teapot to steep the herb for 10 minutes. Strain the herb as the infusion is poured into a cup. Ratio: 1-2 teaspoons per cup of water. Medicinal Extract Ratio: 10-30 drops in water 1-4 times per day, as directed by a practitioner. Medicinal Tincture: 5 ml, twice daily for depression or headaches. Chest Rub Ratio: Add 1 ml oil and 5 drops chamomile oil to 10 ml base oil for bronchial spasm. Massage Oil Ratio: 1 ml lavender oil to 25 ml base oil. 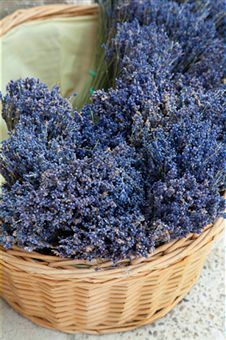 Whole or ground flowers are used in a variety of culinary dishes including: lavender cookies, lavender sugar, lavender lemonade, lavender vinegar, lavender honey, lavender jelly. FDA has not tested evaluated or approved any form of Lavender for use. Typical Cautions for Lavender as with all other herbs known as relaxants include: caution while operating vehicles, talk to your doctor before use if you may be pregnant or have allergies or drink alcohol or are taking any mediations especially antihistamines and sedatives. Cautions include warning against overdose but there is no known quantity identified as excessive. Lavender as a relaxant leads suspicions to include drowsiness as a symptom of an overdose. More likely, identified side effects can be attributed to plant-based allergies. If you have a history of plant allergies approach lavender with normal caution. Allergic reactions include respiratory or dermatologic symptoms including difficulty breathing, swelling of the throat or facial areas or hives, including itching, redness and swelling. Should these symptoms manifest follow regular allergy protocol. Current average price of dried flowers is $10-$20 per pound. Current average price of lavender oil is $9.00 – $12.00 for a one ounce bottle; $80.00 – $95.00 for a 16 ounce bottle. Local health food stores, culinary markets and herbs stores generally stock lavender or can order it for you. Use reputable suppliers when buying online. It’s better to purchase lavender from suppliers with excellent reputations such as Dry Creek Herb Farm in Sacramento, CA http://drycreekherbfarm.com/catalog/ or Jean’s Greens in Upstate New York http://www.jeansgreens.com/. Sequim, Washington has lavender farms. They have a festival and sell lavender.